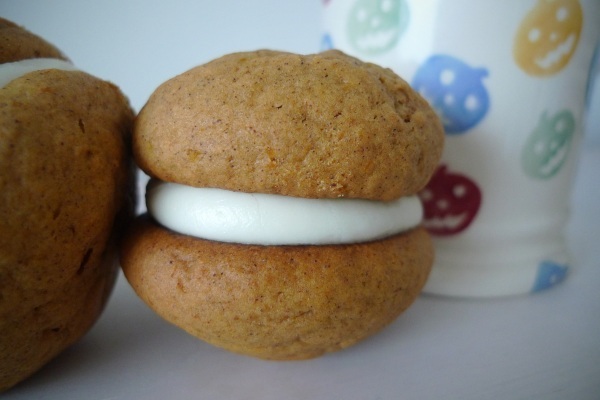 I’ve already made Smashing Pumpkin cupcakes, so I thought I might as well call these Smashing Pumpkin whoopie pies. Well, why not, eh? There’s a Smashing Pumpkins video after the recipe for your viewing pleasure. 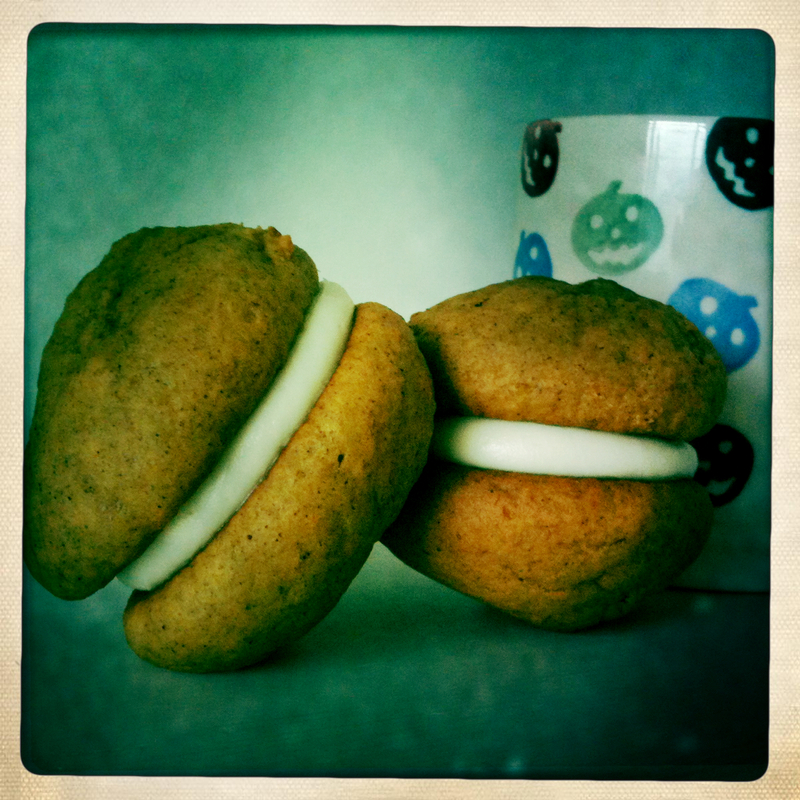 Here’s the recipe, adapted from Whoopie Pies by Sarah Billingsley and Amy Treadwell. Makes approx 12 whoopie pies. (A tip: stick to using either cups, ounces or grams for the measurements otherwise it’s likely to end in tears). Preheat the oven to 350°F/180°C/160°C (fan oven)/Gas mark 4. Line a baking sheet with baking parchment or a non-stick Teflon baking sheet. So far, so easy. Next, mix together the flour, baking powder, bicarb, cinnamon, ginger, nutmeg and salt in a bowl. In a new (and bigger) bowl, cream together the sugar and butter using a fork until it forms a creamy mixture. Now, mix in the pumpkin, followed by the egg and the vanilla extract, stirring in between each addition. Add the flour mixture and mix together until it’s all combined. You want to make your pies as even as possible, so either use a two-tablespoon scoop (such as an ice cream scoop), or pop your mixture into an icing bag. I used disposable icing bags to pipe out rounds about 2 inches across onto the baking sheet. Make sure they’re well spaced as they’ll expand as they cook. You might need to bake them in two batches, depending on the size of your oven. Bake for 15 minutes or until the they’re firm to touch and just starting to turn golden brown. After removing them from the oven, allow to cool on the baking sheet for five minutes before transferring to a wire rack. Once completely cool, you can make a start on the filling. Cream together the cream cheese, butter and icing sugar in a bowl using a fork, and once combined, add the vanilla extract and mix in. Spoon the filling into a piping bag and ice half your rounds with a generous helping of filling, before popping the tops on to make your pies. Easy. 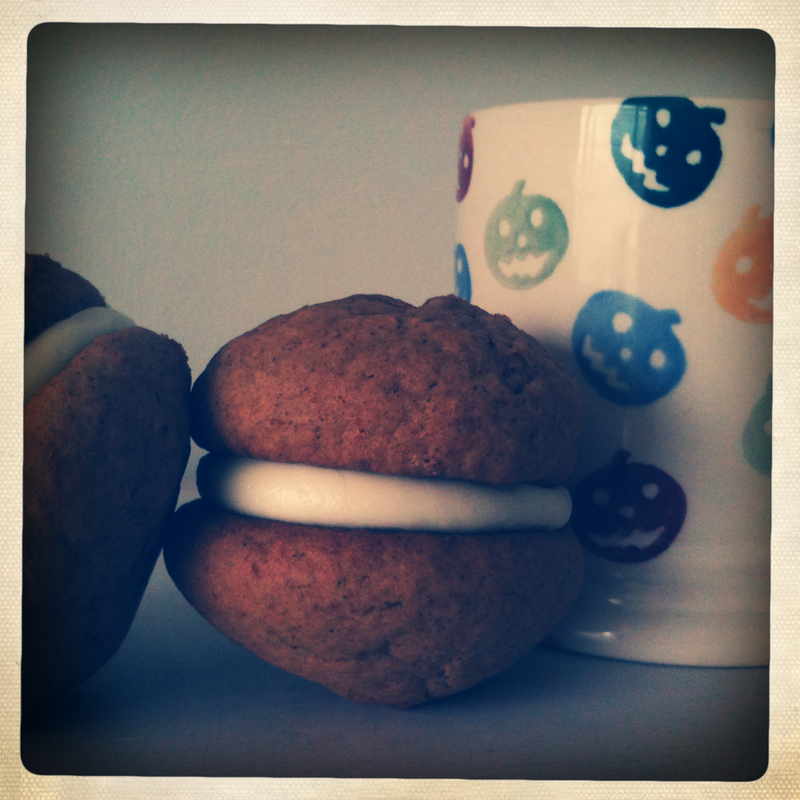 This entry was posted on 06/11/2011 at 2:47 pm and is filed under American food, Baking, Cakes, Recipes, Seasonal food with tags Baking, Cakes, Food, Halloween, Pumpkin, Pumpkin whoopie pies, Thanksgiving, Whooopie pies. You can follow any responses to this entry through the RSS 2.0 feed. You can leave a response, or trackback from your own site. These look fantastic – perfectly formed wonders. This looks incredible! Thanks for sharing!